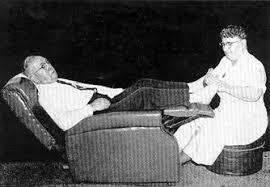 Dr William Fitzgerald introduced the theory and practice of Zone Therapy in the 1900’s. He found that applying pressure in one area caused an anaesthetic effect in a corresponding area. Fitzgerald systemised the body into 10 equal longitudinal zones from fingers to toes to head. Ten, corresponding to numbers of fingers and toes. Left thumb being in the same zone as the left big toe. The basis of the theory is that direct pressure applied to any part of the zone will affect the whole zone. 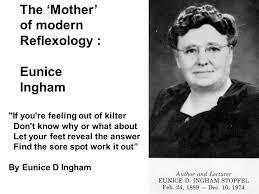 Eunice Ingham refined Zone Therapy into Reflexology in the early 1930’s, pinpointing feet as a target due to their sensitive nature. She developed a map of the entire body onto the feet. Using alternating pressure, not constant direct pressure, she monitored the effects. She found them not only to be pain-reducing but therapeutic in addition. 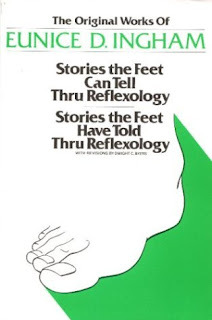 Reflexology was popularised in her book in 1938: “Stories The Feet Can Tell Thru’ Reflexology”.